As the Assad regime becomes increasingly desperate, its forces are starting to shell civilians in every major city across the country. Troops loyal to President Bashar al-Assad are attacking civilians and rebel forces alike around Hama, Homs and Aleppo, according to a report issued Wednesday by the United Nations Relief and Works Agency (UNRWA). Nearly 50,000 people have died since the savage civil war began in March 2011, with a simple scrawled grafitti message of protest by a teen on a wall in Dera'a. Large-scale electricity and water shortages have been reported across Syria, an increasing concern as the frigid winter sets in. In Aleppo, the country's northern commercial hub, power has been unavailable for the past week, and there have been reports of no running water for the past five days, UNRWA said. Every major artery to the city has been cut off in clashes between government and rebel forces with the exception of the Damascus-Aleppo highway. Meanwhile, the international Al Qaeda terrorist organization is taking advantage of the chaos in the country to stage a comeback there, much as it did in Libya during the revolution that deposed dictator Muammar Qaddafi last year. Syria's Al-Nusra Front terror organization is an affiliate of Al Qaeda, believing in the hope of reviving the Islamic Caliphate that will build a Muslim Empire to eventually rule the world. It is one of 13 factions in the radical Islamist rebel council that announced its secession from the main opposition force several weeks ago. 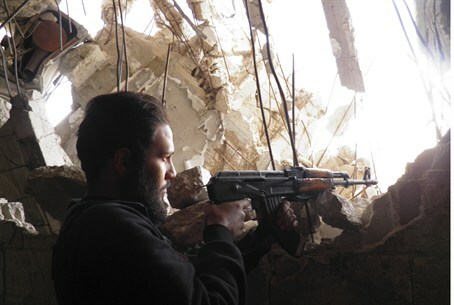 The United States added the Al-Nusra Front to the official list of terror organizations last week. The greater danger lies in its ability to draw others to its ranks: The group is gaining popularity as Assad's Alawite faction, an offshoot of the Iranian affiliated Shi'ite Islam, falls out of favor. Al-Nusra is beginning to recruit from the ranks of Sunni Muslims, who until now have remained moderate and loyal to the mainstream rebels. Al-Nusra Front was responsible for the deadly suicide and car bombings recently in Damascus, Dera'a, Homs and Hama, according to the SITE Intelligence group. Dozens were killed in these attacks; in one suicide bombing, 60 alone were murdered. Air strikes, clashes and shelling also continued for a sixth day inside Yarmouk, a suburb of Damascus that began as a refugee camp for Arabs who had fled Israel in times of war, and their descendants. Originally home to more than 150,000 residents, Yarmouk has become a ghost town over the past week, with some 90 percent of its people having fled the violence.